WITH A population exceeding 120 million, crowded into a space about the size of NEW YORK state (but with nearly six times the population), the island of Java is one of the most densely populated places on Earth (2,070 inhabitants per square mi or 864 per square km). Java is not the largest of the islands of INDONESIA, but it is certainly the nation’s political, historical, and economic core, with 60 percent of Indonesia’s total population, and most of its wealth concentrated into less than 7 percent of the nation’s total land area. But the future may change this status, as mineral and fossil fuel wealth in the outer islands leads to increased migration away from Java and increased demands for political and economic autonomy. The 13th-largest island in the world, Java is the fifth-largest island in the Malay Archipelago. It is the smallest of the Greater Sundas (which also include BORNEO, SUMATRA, and Sulawesi), with a total area of 48,830 square mi (125,205 square km). The island is bordered on the south by the INDIAN OCEAN, which drops relatively quickly to great depths, plummeting up to 24,440 ft (7,450 m) in the Java Trench, the deepest point in the Indian Ocean. The rest of the island is surrounded by shallower seas, on the west, the Sunda Strait, with the island of Sumatra only 16 mi (26 km) distant; on the north, the Java Sea; and on the east, the Bali Strait, separating Java from Bali by only 1 mi (1.6 km) at its narrowest. Part of the Pacific RING OF FIRE, Java was formed from a series of volcanoes running west to east. There are more than 100 volcanoes, 13 active in recent history. Most of the high peaks are concentrated along the southern edge of the island, about 20 of which exceed 8,000 ft (2,424 m). Semeru, in the eastern part of the island, is the highest active volcano on Java (12,131 ft or 3,676 m) and erupted most recently in April 2004. Merapi erupted in 1994, killing 37 and forcing 6,000 to evacuate the area. The most notable, however, is located just offshore to the west: Krakatau, site of the largest volcanic explosion of modern times (in 1883, killing 36,000 people in western Java and reddening the sky as far as Europe and America). From the mountainous south, the island’s topography then slopes generally downward toward the north shore, where there are more level and fertile plains, followed by mangrove swamps and ample harbors. Most agriculture and population centers are thus concentrated on the north shore. The mountains also contain significant natural resources, including tin, sulfur, asphalt, manganese, limestone and marble. Petroleum deposits are located near Rembang and Surabaya in the north and northeast, and on the island of Madura. Rice is cultivated across Java, along with sugarcane, though much of the island is covered with dense forests, rich in plant and animal wildlife like the Javanese tiger, and teak and mahogany trees. Ornithology is especially diverse, including numerous species of peacock, quail, heron, cuckoo, and hornbill. Temperatures can vary from the mountaintops to the lowlands by up to 20 degrees. One in three Javanese lives in cities, four of which have over 1 million inhabitants. The largest of these is JAKARTA, the capital of Indonesia, with its port of Tanjung Priok, 6 mi (9 km) to the east. Jakarta has recently become the center of one of the world’s densest and fastest growing conurbations, referred to as JABOTABEK (Jakarta, Bogor, Tangerang, and Bekasi), home to nearly 20 million people. 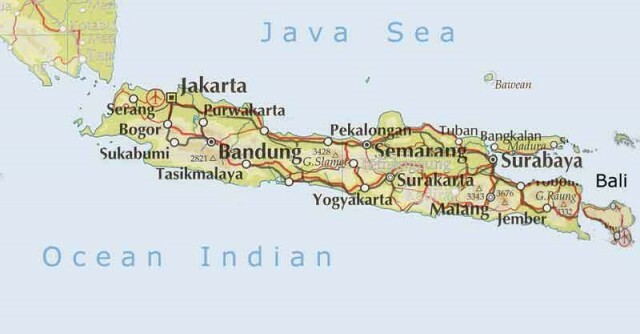 Java’s other largest cities include Surabaya, the second-largest and center of much of Java’s industry and trade; Bandung, on a high plateau in the northwest, formerly the heart of Dutch coffee and tea plantations, and more recently home to high-tech industries such as aeronautics; and Semarang, the island’s fastest-growing city, on the northern coast. Jogyakarta, in central Java, is a smaller city but has been the spiritual and cultural heart of Javanese culture for centuries, and its ancient palaces and temples continue to make this Java’s main center for tourism. Today, Java is almost entirely Muslim, but before Islam arrived in the area, the island was ruled by Hindu and Buddhist princes (Bali remains predominantly Hindu today). The name Java itself probably derives from a Sanskrit (ancient Hindu) word for the type of grain grown locally. Numerous temples survive from this period, notably Prambanan (from the 10th century), and Borobudur, the largest Buddhist temple in the world. These princes were at their height in the 1300s, when the Majapahit Empire dominated the entire archipelago, and Malayan became the lingua franca for most of southeast Asia. This empire was dismantled by waves of Arabic traders, until it disappeared altogether in 1518. Bantam and Mataram were the strongest sultanates in the region when the Europeans arrived in the late 16th century. The Dutch established themselves in 1619 at an old Javanese fort called Jakarta and renamed it Batavia. Total control of Java was achieved in 1756 after the bloody Java War, followed by gradual assertion of Dutch control over the neighboring islands of Sumatra, Borneo, and the rest of what is now Indonesia by the end of the 19th century. External trade was controlled by Europeans, while internal trade was taken over by Chinese immigrants encouraged by the colonial administration. The Javanese economy was transformed into plantations for sugarcane—the largest producer in the world by the end of the nineteenth century. Conditions for the Javanese were rough under Dutch rule, and the Japanese occupation during World War II encouraged them to fight for independence, which was proclaimed in Jakarta in 1945 but not recognized by the Netherlands until 1949. Three major ethnic groups occupy the island, each with their own language: Sundanese in the west (including Jakarta), Javanese over most of central and eastern Java (with about 75 percent of the population), and Toba Batak in the northeast corner and on Madura. Javanese culture is famous for its shadow puppets and gamelan orchestras. These three groups are by far the largest ethnic groups in all of Indonesia (Javanese 45 percent, Sundanese 14 percent, and Madurese 7.5 percent), and their language formed the basis for the national language, Bahasa Indonesia. Current issues facing the Javanese include controlling the population expansion; programs for reducing family sizes were begun in the 1960s, accompanied by government resettlement projects, which also has a secondary aim of attempting to “Javanize” the Outer Islands of Indonesia, particularly in sensitive areas like Aceh in Sumatra, West Papua, and Kalimantan, all with strong separatist movements. Farmers are especially encouraged to emigrate to the other islands, but face resistance from locals who resent dominance from Java, politically or culturally. While Java is by no means dependent on the Outer Islands for its existence, the central government in Jakarta is certainly concerned with the loss of potential riches as the mineral wealth of these regions becomes more commercially developed and exploited.